1 free kids meal per adult entree purchase but additional kids are only $1.00. One free kids' meal per paying adult. Kids eat free on Tuesday at Austin Grill. Dine in only. Kids 10 and under with adult entree purchase. Kids eat free with one adult entree purchase. Kids 5 and under eat free with the purchase of adult brunch. All kids under 40 inches in height can get a free baby cone. Free kids cheese quesadillas, dine in only. Two free kid’s meals for every adult dinner purchased. Two free kid's meal for every adult meal purchased. Two free kids meal for every adult meal purchased. Free kids meal when you purchase a combo meal on Tuesdays. Kids eat free with purchase of an adult buffet. Be sure to use the printable coupon on the children's menu. Kids eat free on Sunday evenings. Kids eat free on Tuesdays and Saturdays. Be sure to call ahead to confirm your store participates in free kids meals on Saturdays. Kids 12 and under eat for free. A purchase of one adult entree and one child’s drink is a required. Kids eat free on Tuesdays (Varies by location so call ahead of time). Kids eat free + discounts on adult meals. Can vary by location. Kids 12 and under eat free with each purchase of an adult meal. Kids 10 and under get a free buffet. Kids eat free with purchase of adult buffet. Use coupon on the kids menu. Kids eat free everyday. Not valid at all locations. Kids eat free with purchase of regular adult sub. Kids 12 and under eat free on Tuesdays. Two children per one adult entree. Kids get a free drink and ice cream with their meals. Free sundae with kid’s meal purchase. Free kids meal with the purchase of an entree (sub, toasty torpedo, regular chopped salad). Kids 12 and under eat free on Mondays and Tuesdays. Kids 12 and under can dine for free on Mondays at Rio Wraps. Dine-in only. Kid’s eat free with purchase of an adult entree. Kids 4 or younger eat free everyday with an adult entree purchase. Kids 4 and under at free and kids 5-12 eat for $2.49 on Sundays. Kids 10 and under can enjoy a kid’s meal for .99 every day of the week. Kids 12 and under eat free on Tuesdays. So there you go! 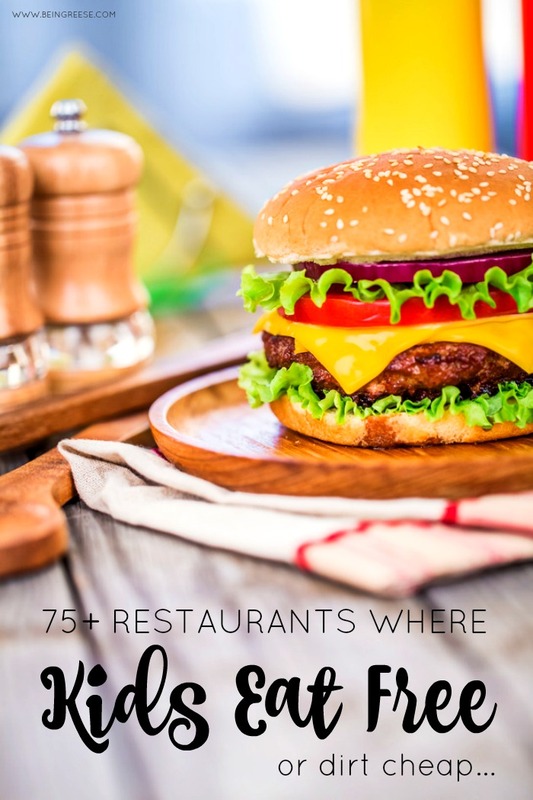 75 place to take your kiddos for a free meal. Once again, if you enjoyed this list, be sure to Tweet it, Pin it, Facebook it, or like it on Google +.